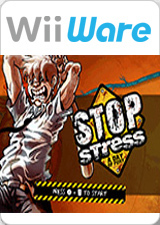 Stop Stress: A Day of Fury is a WiiWare video game and was published by Abylight. Jack, possibly the most stressed out man on the planet, is awakened from a peaceful slumber and pleasant dream by a cacophony of sounds - including a baby crying, doors slamming and an alarm clock - Jack's day does not get off on the right foot. This is a man with very high blood pressure and very little patience and it’s enough to send him over the edge. The graph below charts the compatibility with Stop Stress: A Day Of Fury since Dolphin's 2.0 release, listing revisions only where a compatibility change occurred. This page was last edited on 13 January 2018, at 14:05.